The Vegetable Patch is a therapeutic dvd designed to facilitate reminiscence and social engagement in the person living with Alzheimers or other form of dementia. 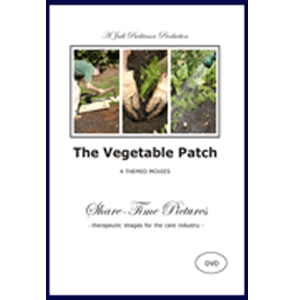 The Vegetable Patch is a therapeutic dvd designed to facilitate reminiscence and social engagement in the person living with Alzheimers or other dementia. It features a main 28 minute long movie that shows a man building a vegetable garden, children helping to plant seedlings, birds in the garden, vegies growing. Still images are interspersed throughout the movies. There are no subtitles and the images are backed with relaxing music.